On a decadal time scale, last year is hauling the chart upwards, being way above the latest decadal average. Below is a chart showing decadal changes, starting from the sixth year in each decade to show the full decade up to December 2015. Here is another decadal chart, starting from the first year in each decade. In this case the most recent decade has six years of data so far, from 2011 to 2015 inclusive. Where did it get hot and where was it colder? To see where it's been extra warm this past 12 months, here is the map from NOAA showing the land and ocean temperature percentiles, with the record warmest and record coldest. I've added some arrows. 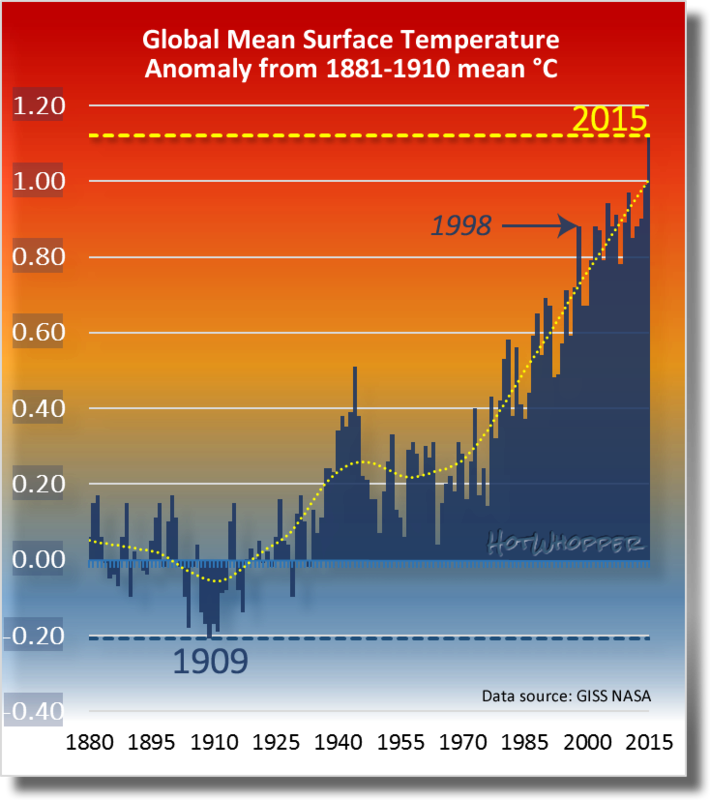 Below is a chart showing the hottest years, starting with 2015 on the left. 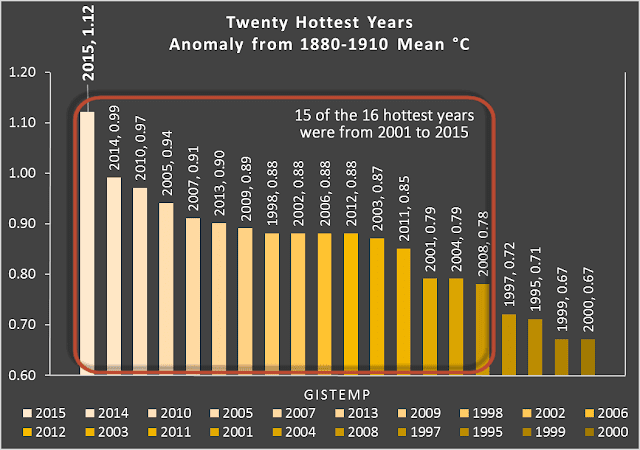 As the chart and the table underneath show, fifteen of the sixteen hottest years were this century. 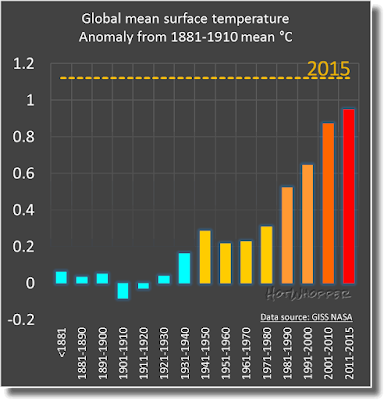 2015 broke the mould by being a huge 0.13 °C hotter than the previous hottest year. The previous biggest jump (just in the top 20) was less than half that, at 0.06 °C. I checked again. There have been two occasions when there were bigger hikes from one year to the next in the past twenty years: 1997 to 1998 and 2004 to 2005. It has happened on average about one in ten years since 1880. 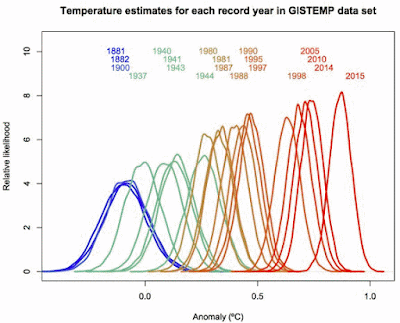 Update: Gavin Schmidt updated this chart he provided last year, on Twitter and at realclimate.org. A raucous din from science deniers saying "see, it's record snow. Global warming is a hoax". Or it might not. It's still too soon to say, although Bob Henson wrote: "computer models were in remarkable agreement late Tuesday" - then again - models, huh! I suspect Tom Karl and Gavin Schmidt won’t bother to tell the public that lower troposphere temperature data were far from record highs in 2015. He was wrong. They did "tell the public" about the lower troposphere temperatures in their main presentation - and said the annual temperature wasn't a record (without prompting by anyone). Bob's also wrong about the upper air temperatures being far from record highs. On an annual basis the lower troposphere temperature record makes 2015 the third hottest year on record, which is not far at all. As well as that, the last three months of the record each broke the record for that month. 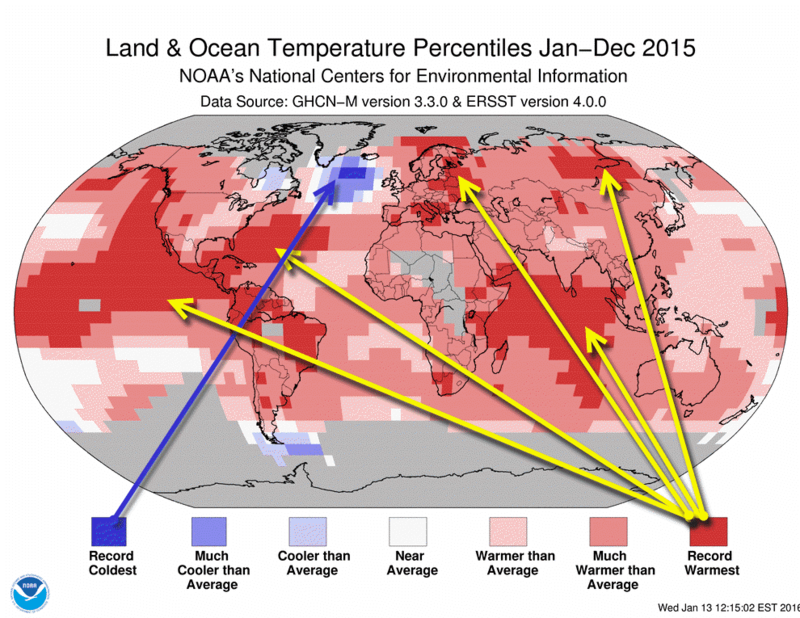 That is, there was a record hot October, a record hot November and a record hot December. 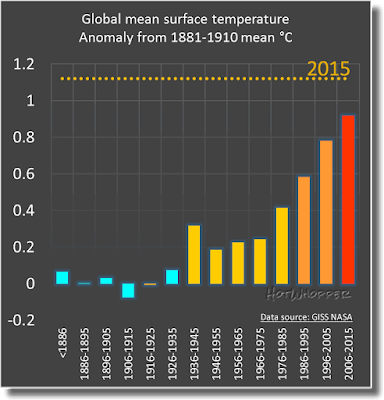 According to new Berkeley Earth analysis, 2015 was unambiguously the hottest year on record. For the first time in recorded history, the Earth’s temperature is clearly more than 1.0 C (1.8 F) above the 1850-1900 average. 2015 was approximately 0.1 degree C (about 0.2 degrees F) hotter than 2014, which had tied with 2005 and 2010 as the previous hottest years. 2015 set the record with 99.996% confidence. The analysis covered the entire surface of the Earth, including temperatures from both land and oceans. I can't sleep because it is still 30C at 4am in Sydney. It was a good NASA/NOAA conference, and excellent questions too. The headlines will be interesting. Up at 0400 this morning. Bedrooms are 26C and the upstairs living area 28C. Bob Tisdale has dug himself into a big hole with those articles. First, they discussed the atmosphere data sets at length including the balloon data which does appear to be showing a record high. Second, if the satellite data sets hit a record peak in 2016 bang goes all the "no global warming since..." arguments. The deniers will not be able to turn around and try and discredit satellite data after promoting it so much. Even Dr Roy Spencer has given himself an out on that one. Except they will use the usual techniques to hide any trend. I think they have already started using '5 year smoothing' to hide the uptick. I only caught the last few questions of the press conference, but they mentioned an archived version will be released this afternoon, so, of course I missed the URL. Does anyone know where they archive the conference calls? (Might be worth an update with a link in the story here, as well. Joseph, try here. They usually produce a Spanish-speaking version as well. 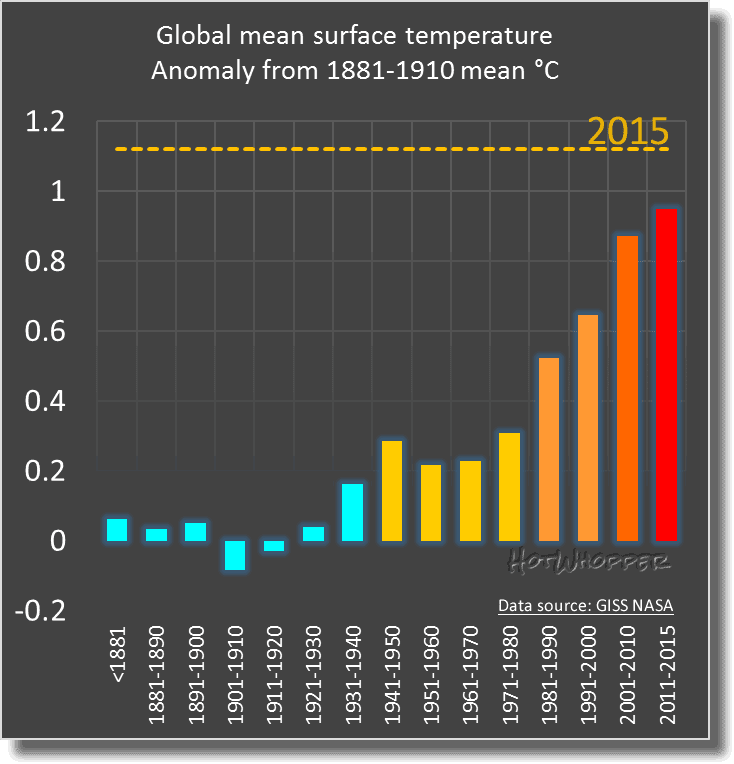 Both the NOAA and NASA figures topped my mid/late-2015 predictions that 2015 would smash the existing records by >0.13 °C and >0.10 °C respectively. 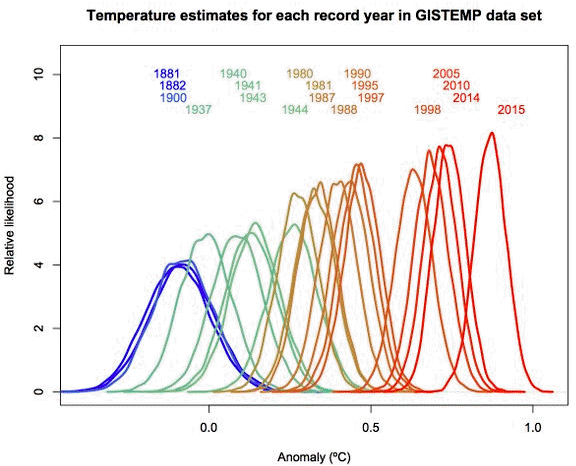 And even more amazingly, in today's news conference Gavin Schmidt and Thomas Karl both agreed with the Met Office's prediction that 2016 will be hotter than 2015. They gave the bet "even money". You write "2015 broke the mould by being a huge 0.13 °C hotter than the previous hottest year. 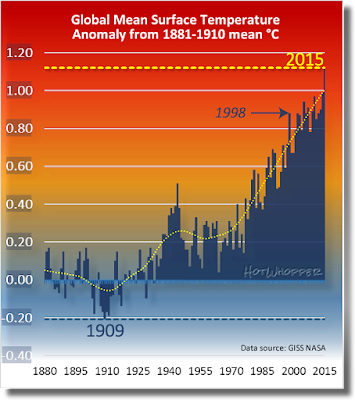 The previous biggest jump (just in the top 20) was 0.6 °C." I wonder if you meant 0.06 °C, or am I missing something? I found it interesting that both Schmidt and Karl mentioned that it was "virtually certain" (94% NASA, 99% NOAA) that 2015 is the warmest year on record. This means that the Watties won't be able to play the game they played last year when there was some overlap in the uncertainty ranges between 2014 and previous records. They also spent a bit of time and a slide addressed to Rep. Smith, who will no doubt be upset with this result. My main take from that observation is just how very much any two successive annual values have to be before we do get an actual "higher value" that doesn't allow the completely specious "reasoning" that no warming is occurring as e saw last year. It's always the trend, and the trend in the surface data is clear.